The sixth-graders, from very opposite sides of the street, sat in pairs, a list of questions before them: "What do you dream about?" ''Do you think about dying?" ''Are you scared?" Their task, at once easy and awkward, was to learn about one another — and differences surfaced quickly. One African-American boy from a public school pulled up a pant leg to reveal where a bullet had pierced his calf in a wrong-place, wrong-time shooting. His partner, a white boy who attends a private school and lives three blocks yet worlds away, was shocked, then saddened. The 40 or so children who'd gathered found common ground, too: a love of family, sports, animals and video games, a wish to one day succeed. "I dream about having a big dog and a big, giant house." ". that I'll get into college and get good grades." ". that I'll always have my friends." Charlie Branda walked around quietly and listened. This is what she'd had in mind when she opened a small art studio on Chicago's Sedgwick Street, smack in the middle of a great divide. The stretch of asphalt in the Old Town neighborhood of one of America's most segregated cities starkly separates black and white, haves and have-nots. The area was settled by German, Irish and Sicilian immigrants until the 1950s and '60s, when white flight began. Then Old Town became an eclectic enclave of African-Americans to the west and Puerto Ricans and hippies to the east. Massive public housing high-rises sprung up nearby, only to be gradually torn down as the neighborhood gentrified. Today, on the west side of Sedgwick, stand blocks of subsidized housing where mostly African-American families live. On the east side are condominiums and luxury homes, filled mostly with white families. Both sides of the street are lined with metal fences and gates, often locked — sometimes to keep people out, sometimes to keep them in. Branda is not an artist. The 53-year-old mom and former commercial banker simply wanted to get to know her neighbors better and connect the two sides of Sedgwick. "The way it is now isn't the way it has to be," she remembers thinking. But could something like art really help bring together one deeply divided neighborhood in a city, and a country, so desperately in need of unity? Branda had lived for years in and around Old Town when she moved with her husband and two children to a red-brick, two-story house on the east side of Sedgwick in 2008. Initially, she joined with her neighbors to demand, with some success, that the city, police and absentee landlords do something about drug-dealing and occasional gunfire in the neighborhood. But she also spent a lot of time walking around, ignoring those who advised her to stay on "her side" of the street. "Hello!" she'd chirp, smiling as she regularly greeted strangers from Marshall Field Garden Apartments, the place one white homeowner calls "the 800-pound gorilla in the neighborhood" because of the perceived influence its 3,000 residents — most of them African-American and two-thirds younger than 18 — have on life here. Precious Murphy, a mother of four who lived in Marshall Field, was among those Branda frequently encountered. Murphy was more accustomed to watching white parents scoop up their kids and leave when she and her children arrived at neighborhood playgrounds. "But Charlie, for some reason, she just kept coming back," Murphy says. Then in 2013, a young African-American father from the Marshall Field complex was fatally shot while on his way to get diapers at a convenience store, just steps from the Brandas' home. Some residents were ready to move, and at least one family on Branda's block eventually did. But she couldn't shake the idea that she didn't even know the family that had lost a loved one. "She saw us as neighbors," says Adell Thomas, a longtime resident of Marshall Field and president of its tenants' association. Branda had been reading a book — "Make the Impossible Possible" by William Strickland Jr., a community activist in Pittsburgh who credits a high school art teacher with helping him find his way in life. She kept thinking about an image Strickland described: a ball of clay and how "you can make a miracle with your hands," she recalls. Branda began telling people about her vision for a neighborhood art studio, and eventually presented the idea at community meetings. Thomas was inspired: "Man," she thought. "I want to be part of that." As she got to know Branda, Thomas was surprised to learn she'd grown up in Anchorage, Alaska, with a single mom and modest means. Branda, meanwhile, saw a bit of her tough-yet-compassionate mom in Thomas. A few others, including Murphy, joined in. A board was formed. And in October 2015, the first Art on Sedgwick studio opened in a tiny storefront across the street from Marshall Field Garden Apartments. That day, neighbors stopped to write on a chalkboard outside the studio that had rows of the unfinished sentence, "Before I die, I want to ______." "Do Art," one girl wrote. The first classes, including cartoon drawing and embroidery, were small but consistently attended. The victories also were small, but satisfying in their own way. It started with "just showing up," says Cory Stutts, middle school director at the private Catherine Cook School, two blocks east of Sedgwick Street. Stutts was embarrassed that she'd seen so few Catherine Cook families at Art on Sedgwick events that first year. She blamed herself. So to set the example, she signed up for a group outing to a museum. Stutts, who is white, met Thomas on the trip, their conversation sparked by admiration of a pair of earrings. Soon they connected on social media and met again later with others from the neighborhood for a peace march to protest Chicago's gun violence. Stutts' next goal was to get more of her students involved. That chance came with what was informally known as "the kite project," which brought together the sixth-graders from Catherine Cook and Manierre Elementary, a public school tucked behind the Marshall Field apartments. Though Manierre sits just four blocks from her own school, Stutts never knew it existed until she spent time at Art on Sedgwick. The students met for three sessions during school hours in spring 2017. They started out with the icebreaker interviews, then photographed one another and eventually made kites with those photographs. Cecil McDonald Jr., an artist-in-residence at Art on Sedgwick, conceived and led the project. But it was Branda who suggested pairing the two schools, introducing administrators, teachers and students in what would become a mini-social experiment. Since so few kids volunteered when she first floated the idea, Stutts made it a class project. "There's benefit in being uncomfortable," she told her students. At the portrait session, Catherine Cook student Dylan Flohr posed for the camera. A girl from Manierre leaned toward him and said sweetly, "I like how you smile." ''Thanks," he responded, shyly. There were some tense moments, too. At one point, a Manierre student confronted a girl from Catherine Cook because she thought she gave her a dirty look. The private school kids complained that the public school students were sometimes too loud. But eventually, they began to mix more informally, chatting or teaching each other hand-clapping games. "A group of white kids and black kids playing together — you really don't see that nowadays," marveled participant Eric Evans, now an eighth-grader at Manierre. With each art show and class and community event, more participants have trickled into Art on Sedgwick. One Saturday each month, a faithful group of adults from varied backgrounds gathers for a "Sip and Paint," a chance to do art, chat and drink a little wine. Branda and Thomas, now friends, often take part. "In some ways, I feel like we've accomplished so much in terms of building community and maybe changing the discussion," Branda says. "On the other hand, I feel like we've just barely scratched the surface." Last year, she ran Art on Sedgwick on a budget of $35,000 and expects it to be only slightly larger this year. She takes no salary and manages this, in part, by doubling as the director of the Marshall Field community center. Thomas works with her there, too, and continues to have faith that they can have more impact. "We're doing this," she says, when asked about their chances. "Yeah. We're doing this." In March 2017, just before the start of the kite project, Art on Sedgwick moved into a larger storefront studio in Marshall Field Garden Apartments, which had been sold. Some in the neighborhood had privately hoped the new owners would convert the buildings — built in 1929 by the family of the department store magnate — into luxury condos. Instead, they kept the complex subsidized. They also renovated each apartment to the delight of many residents, whose units had been plagued by rodents and were often in disrepair. The day of the studio move, a group of African-American men showed up in the cold to lug boxes, tables and artwork across the road. "Here to help Ms. Charlie," one said, as Branda trotted alongside with a large painting. The men were from Brothers Standing Together, an organization that supports people recently released from prison. Raymond Richard, its founder and a former gang member who grew up in the old Cabrini-Green public housing complex southwest of Sedgwick, had become friends with Branda when he led a poetry workshop at her home. Branda's move across the street reminded Richard of a day more than three decades ago, when someone challenged his young self to cross a street into Chicago's downtown for the first time. He was hesitant, but when he did it, the man told him, "See? You just came that much further." "That was a lasting impression on me," says Richard, whose youth was largely spent in a four-block area. As he saw it, moving Art on Sedgwick inside the Marshall Field apartments would challenge others, especially white neighbors, in a similar way. "We have to step across the street," he says. "It goes both ways." There are people on both sides of Sedgwick who aren't as sure the issues that divide them can be overcome. A few months back, Branda's next-door neighbor, Jerry Capell, drove past Marshall Field for the first time in a while, right by the same corner where the young dad was killed in 2013. Capell, a white resident who moved with his husband to the east side of Sedgwick in the late 1990s, commented aloud that there seemed to be less crime — "activity," as he called it. He and others say the change in management at Marshall Field and another group of subsidized buildings next door has helped. But as property values on his side of the street have increased, he says the disconnect between the west and east sides of Sedgwick is "as wide as it's ever been." The father of two adopted African-American children, Capell sees that divide as more economic than racial. Either way, he says, "people tend to hang with people who are like them." "It's a shame," he adds. From her apartment on the other side of the street, Sherise McDaniel, mother of Manierre student Eric Evans, also still sees very separate worlds. "I would consider Charlie the exception. 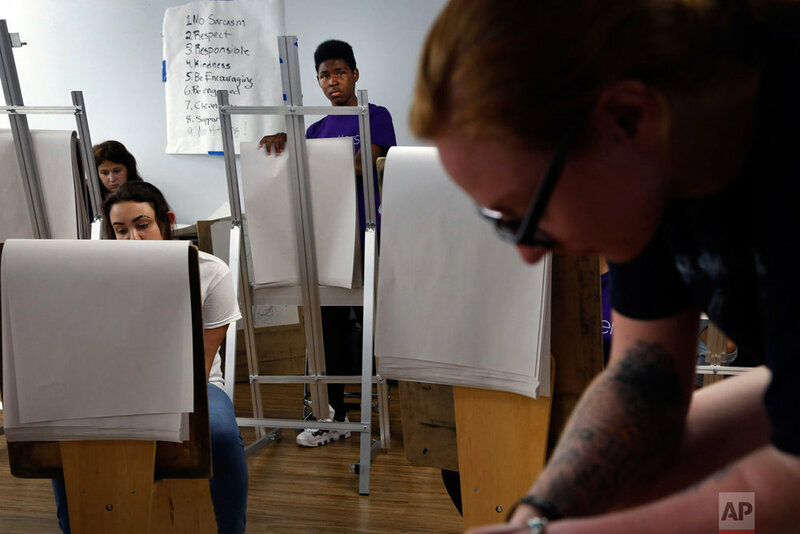 Charlie is like a vein connecting those people to us and us to them," says McDaniel, who is African-American and a special education aide at a high school. She has lived in Marshall Field apartments since 2000. "I love this neighborhood. ... I love this city. I wish it loved me back." And though she remains proud of Art on Sedgwick, Precious Murphy, one of the original board members, moved to Bloomington, Indiana, in search of safety for her children and new opportunities. Branda, nevertheless, senses a "deep love for this place and for this ground" from many people on both sides of the street. She thinks about that a lot as she continues to walk the neighborhood, still smiling, still greeting people, many who know her now. With each step, she considers the many whose feet have touched the same pavement. "You can't 'un-connect' us," she insists. She gets teary when she says this. "I think I'm tired of the divisiveness," she explains. A while later, outside the Art on Sedgwick studio, a few kids from Marshall Field run to hug her, as they often do. "Hi, art teacher! Hi, art teacher!" they shout. Branda wraps her arms around all of them, closing her eyes as she squeezes tightly. She still doesn't consider herself an art teacher. But she is their neighbor. 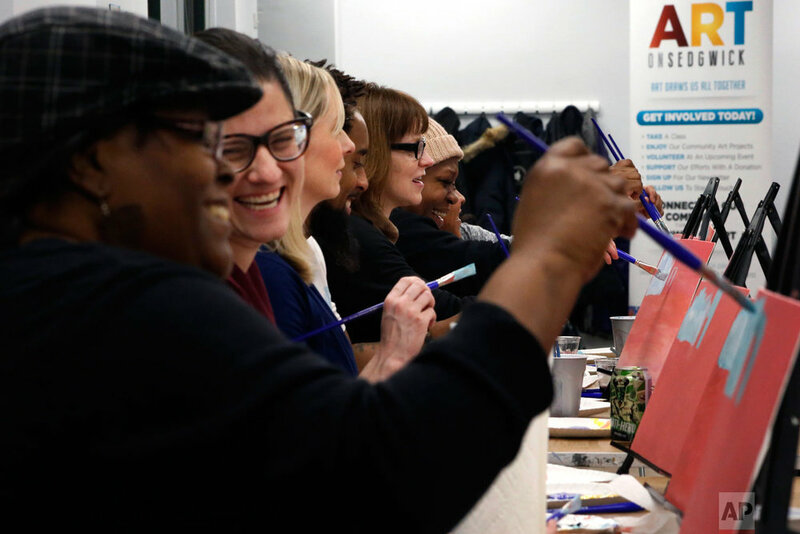 Text from the AP news story, In Chicago, a little art studio bridges a great divide, by Martha Irvine.